It’s tough watching parents age, possibly even losing some of their mobility and independence. One concern that you, and they, may have is whether they can remain in their home. They certainly may be able to and, besides having adequate homeccare for them, there are things that can be done to the home itself to make it easier and give everyone in the family peace of mind. If they want and are able to remain in their current home, you may need to consider making modifications to the home. 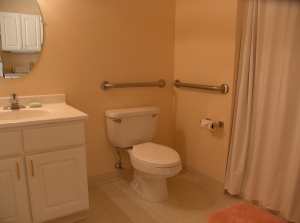 These can be as simple as adding extra handrails to stairways, or installing grab bars and an elevated toilet seat in the bathroom, to making major upgrades or renovations to the home, such as widening doorways, hallways, etc., lowering entire countertops and cooking areas to installing under-cabinet lighting, rollout shelves or Lazy Susans, stair lifts, etc. If they wish to remain independent but perhaps don’t need as large a house or apartment as they currently have, consider downsizing. A smaller home is certainly easier to maintain and many newer homes these days are being built with wider doorways and other design features geared toward an aging generation. Even an in-home elevator, once considered something only for the rich, or at least the space for one is being planned for or automatically constructed in some homes. Of course, paying for such modifications—especially if major—or building a new place can be pricey. You and your loved one might consider paying for it by their taking out a home equity loan or doing a reverse mortgage. Their financial institution may also offer other options. If your loved one is a veteran, he or she may be eligible for a grant to construct or retrofit their home (see www.benefits.va.gov/homeloans/adaptedhousing.asp). If they are leaning more toward selling their existing home and buying or building new, there may well be plenty of cash to do that from the sale of their current home, especially if they’re downsizing. Other features that can make aging in place easier for family members is today’s technology. There are plenty of options for helping them and you keep in touch besides the phone, ranging from email to texting to Skype and the like. Security cameras can be installed for a reasonable amount of money where you can check in on your loved one anytime. There are also emergency alert systems that will alert you if your mom or dad divert from their usual activities or pattern of living. Some such systems can even combine offer a fitness band so they can keep track of their own activity or remind them when it’s time to take their medications. Certain apps for smart phones can also provide med reminders. So just because your loved one is getting older and may not be quite as able as they once were, doesn’t mean they still can’t be capable, independent and safe. This entry was posted in Homecare Arlington TN and tagged Homecare Arlington TN. Bookmark the permalink.